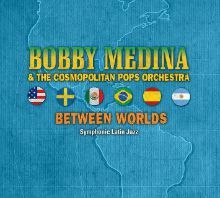 The trumpeter’s album includes much of the repertoire that he and his band played at the recent Ystad Sweden Jazz Festival—with dramatic differences. Orchestras with string sections at sessions in Buenos Aires and Seattle provide soaring accompaniments in arrangements by Medina, pianist Eric Verlinde, saxophonist-flutist Guto Lucena and Lucena’s fellow Brazilian Felipe Salles. To great effect, Salles’ setting of Tony Lujan’s “Forever My Love” alternates dreaminess and zest. Lucena’s arrangements of pieces by Antonio Carlos Jobim and Astor Piazolla capture the composers’ spirits. Medina does the Mexican standard “La Bikina” as a waltz that allows him to double on flugelhorn and accordion.